Midrange travellers seeking a comfortable room in a very convenient location might want to give the Bossotel Inn a look. There’s nothing extraordinary to say about it, but the all-round solid package should satisfy those who prefer a more straightforward hotel experience. Ad Book now! Rates from US$48++. Average rating 8 from 2,929 reviews. The medium-size hotel greets you with a spotless lobby staffed by a professional team of receptionists donning traditional Thai silk uniforms. The woman who greeted us seemed to have a good attitude, and the bellhop who showed us around was happy to answer our questions in English. WiFi is free and the ground floor includes a cafe/bar and tour desk. A couple of modern lifts provide access to the guestrooms. All four of the room types come with wall-to-wall carpet floors, a few different lighting options, decent-size hot-water bathrooms, soft beds and touches of peach, yellow and crimson that lend a warm touch. 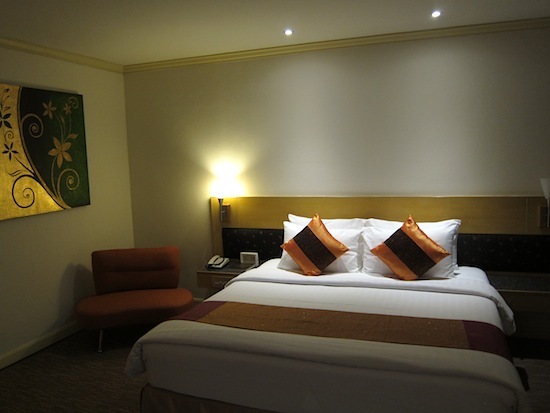 All rooms are also equipped with air-con, TV, minibar, safe and desk. The standard that we checked out had only one small window and a tiny balcony facing an inner garden courtyard. Superiors bag you more space, a hot-water kettle, a bathtub and a wide window. Deluxe rooms are equipped with good-size balconies, some affording lovely views of neighbouring Wat Suan Phlu and other historic buildings. All three of the rooms that we inspected appeared to be immaculately kept. While the design won’t knock any socks off, you can certainly expect to have a good night’s sleep at Bossotel. 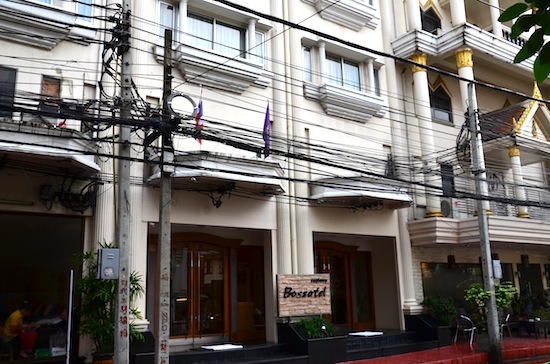 Rates are quite reasonable given the coveted location in a pricey part of Bangkok, but you’ll want to book online rather than as a walk-in. We found that rates offered through the hotel website’s booking engine and on Agoda were around 400 baht lower than the rack rates. While a breakfast buffet is not generally included in the rates, booking online makes it possible to bag breakfast for considerably less than the usual 275-baht price tag. Covering a small area off one of the upper floors, a very narrow swimming pool hardly passes as anything more than a plunge pool but will do the trick for a quick dip. We reckon that you’ll often have it all to yourself, which is a good thing since there’s only enough space for a few loungers. The hotel also has a small spa offering the usual Thai massages, facials and also a Jacuzzi and sauna. Just long enough for a swim. Bossotel’s location is a major selling point. Charoen Krung Soi 42/1 is one of a few low-key side streets that ends at the Shangri La, a massive luxury hotel where you could go for a relaxing sundowner alongside the Chao Phraya River. Walk a few hundred metres in the opposite direction and you’ll hit colourful Charoen Krung Road with its abundant stalls selling Thai sweets, fresh flowers and a dizzying selection of street food. When ready to explore further afield, you can catch the BTS skytrain at nearby Saphan Taksin station or hop on a public riverboat at Sathorn pier. These two options combine to put most of Bangkok within fairly easy striking distance. The nearby Swan Hotel has a bigger swimming pool but is overall a much less inviting option for a few hundred baht cheaper than Bossotel. If you’ve a bit more cash to spend, you could consider one of the larger hotels in this area, like Centrepoint Silom or Lebua Hotel at State Tower. 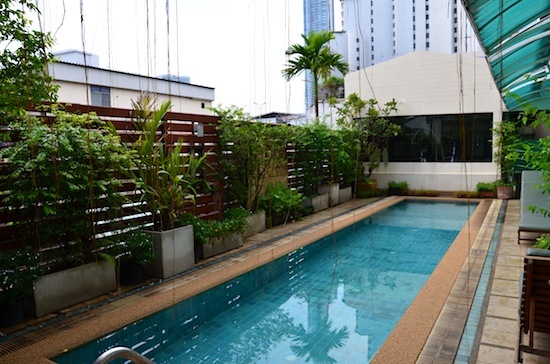 About a kilometre away on Silom Road, Triple Two Silom is also worth considering for a good-value midrange room. Check rates at Bossotel Inn on Booking.com.